On the outskirts of St.Austell town there is a very old bridge that is rarely given a second glance. It no longer carries traffic, other than perhaps a few bicycles. This is a shame because the bridge is well over 500 years old. We know it's minimum age because it was mentioned by someone called John Leland in 1538. He was King Henry VIII's Chaplain who was sent out around the country to gather material for a history of England. Leland, sometimes spelt Leyland, didn't seem to think much of St. Austell as he wrote (in old English): "... the poore toun of St Austelles is nothing notable but for the paroch chirch. And there is a bridge of the same name." 500+ years ago things would have been different. The bridge would then have carried all of the visitors and tradespeople to and from the west of St.Austell town. How times change. The roadway of the bridge (photo below) has, unfortunately now been covered with tarmac but the passing V-shaped places can be seen. 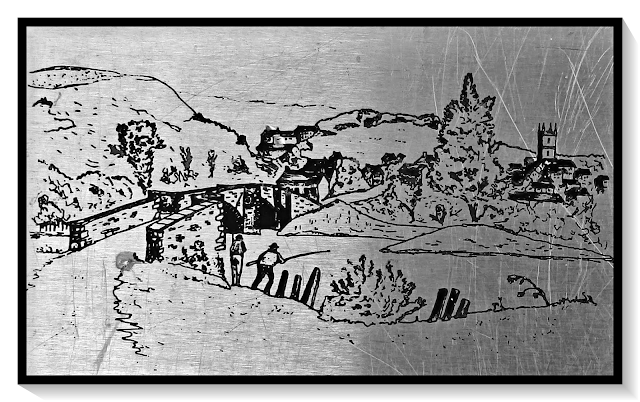 There is a scratched etching of the bridge from 1803, as shown below. The river was wider and faster back then. Besides the river and bridge St.Austell church tower can be seen to the right of the etching. This remains today as can be seen in the photo below. I snapped the photo during the summer months - thus the blue sky! How life moves on, to think of all of the people who have walked the bridge and visited the church over many hundreds of years. The tales they could tell us. It's funny Mike, I always think the same thing...the stories that these places can tell. It occurred to me that now that we have the technology, certain places should have a little recording area for people to offer a little bit about themselves or what they think of a certain historical spot. Generations from now, people like us won't have to wonder, they can hit a button and hear hundreds of years of recordings! Thank you Pam, now that would be interesting - as long as it wasn't abused. There are those who say that various emotions are captured within the walls and surroundings of old buildings - ghosts perhaps!? May sound silly but some old places do feel peaceful while others make us feel uneasy. The stonework on the tower is wonderful. I assume the stone was gathered and cut locally and imagine the hard work required to build such a structure. I love the etching as well and I'm so glad that you are sharing these interesting places. 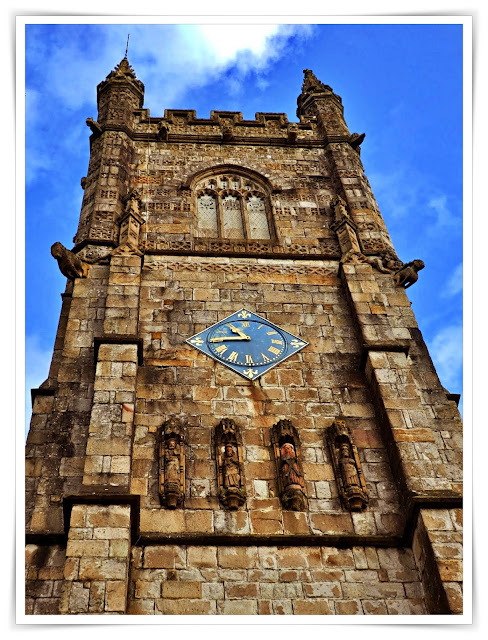 The west end is of the church is made of Pentewan stone(about three of four miles from the church)The remainder is a mixture of both fine-grained granite and Pentewan stone. A church has been here since 1169. The tower is 15th century and is faced in Pentewan stone.